Provençal Talmudist; flourished in the middle of the thirteenth century; a contemporary of the Dominican Pablo Christiani, a former pupil of Eliezer of Tarascon. Mordecai, as the most prominent Jew in Provence, suffered the most from Pablo's attacks. Prior to 1274 Pablo secured an order from the pope to the effect that the Jews in southern France should wear humiliating badges on their clothing. The Provençal Jews, who had hitherto been exempt from these badges, opposed this decree, and Mordecai ben Joseph and a certain Israel were in consequence imprisoned by the inquisitors. They secured their freedom only by the payment of a large sum of money. Mordecai and Solomon of Tarascon were sent as delegates to the royal court in order to secure the repeal of this odious law; and they succeeded. Charles I., King of the Two Sicilies, and Count of Provence, on March 26, 1276, issued a severe decree against the inquisitors who insisted that the Jews should wear badges. As Pablo was now dead the decree was not opposed by the inquisitors. Ibn Verga, who relates this event in his "Shebeṭ Yehudah," says that Mordecai was imprisoned after his embassy to the royal court, which, according to Gross, is improbable and not in agreement with the facts given in the introduction to "Maḥaziḳ ha-Emunah." Mordecai may be identified with Mordecai ben Josiphiah, who with other rabbis of the last third of the thirteenth century signed a ritual decree at Carpentras (Renan-Neubauer, "Les Rabbins Français," p. 518; Gross, "Gallia Judaica," p. 607). 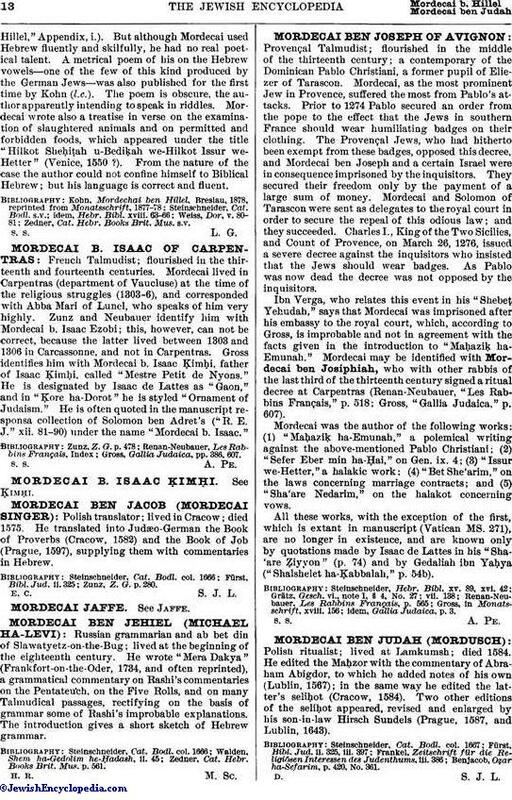 Mordecai was the author of the following works: (1) "Maḥaziḳ ha-Emunah," a polemical writing against the above-mentioned Pablo Christiani; (2) "Sefer Eber min ha-Ḥai," on Gen. ix. 4; (3) "Issur we-Hetter," a halakic work; (4) "Bet She'arim," on the laws concerning marriage contracts; and (5) "Sha'are Nedarim," on the halakot concerning vows. All these works, with the exception of the first, which is extant in manuscript (Vatican MS. 271), are no longer in existence, and are known only by quotations made by Isaac de Lattes in his "Sha-'are Ẓiyyon" (p. 74) and by Gedaliah ibn Yaḥya ("Shalshelet ha-Ḳabbalah," p. 54b). idem, Gallia Judaica, p. 3.